Last year I had the privilege of traveling around Vietnam to experience what the country had on offer. It was an amazing time in my life where I found a new love for Vietnamese cuisine: the herbs, the fresh vegetables and the strange fact that I was eating noodles for breakfast, lunch and dinner. So when I heard of a Vietnamese place that "took you right back" I dialed the number and booked a table for two straight away. The simplicity of Apache's interior design was an Instagrammer's dream - white walls, vintage tiled floors, and hanging lights. This minimalistic approach is perfect to balance the large groups that fill the room and endless conversations between all. We nabbed a table outside and once seated were offered menus and after discussing the specials (and what had already been sold out), I chose the Bhikkhuni and my friend chose the Spinning Pig. Apache's food philosophy is simple, aiming to create food with the five fundamental Vietnamese flavours - spicy, sour, bitter, salty and sweet. All dishes are a modern take on popular Northern Vietnamese hawker food with a touch of French, hence their tagline, "when Hanoi met Paris". Apache also have a wine and beer list which exhibits both New Zealand and Vietnamese beverages. After a short wait, our food and drinks were delivered to our tables and from first instance I was impressed by the abundance of colours and textures. The first chopstick bite of my Bhikkhuni salad contained green papaya, young carrots, cherry tomatoes, long beans, Vietnamese mint, coriander, peanuts and a soy sauce garnished. It was a palate explosion. The freshness of ingredients was evident and the copious amounts of coriander and mint was similar to that of dishes I have tried in Hanoi. My friend and I then began exchanging bites from each others bowls. By this point he had already eaten his pork belly, but I was able to enjoy the lychee and apple Vietnamese mint slaw and deep fried six-minute egg. Each bite was a journey back to Vietnam. The fresh vegetables and portion size was the stand out components of the Bhikkhuni, and the deep fried six-minute egg with its crumbed exterior and runny inside was the standout for the Spinning Pig. Seeing that the pork belly was gone within seconds from my friend's dish, it's pretty easy to deduct what his favourite component was. 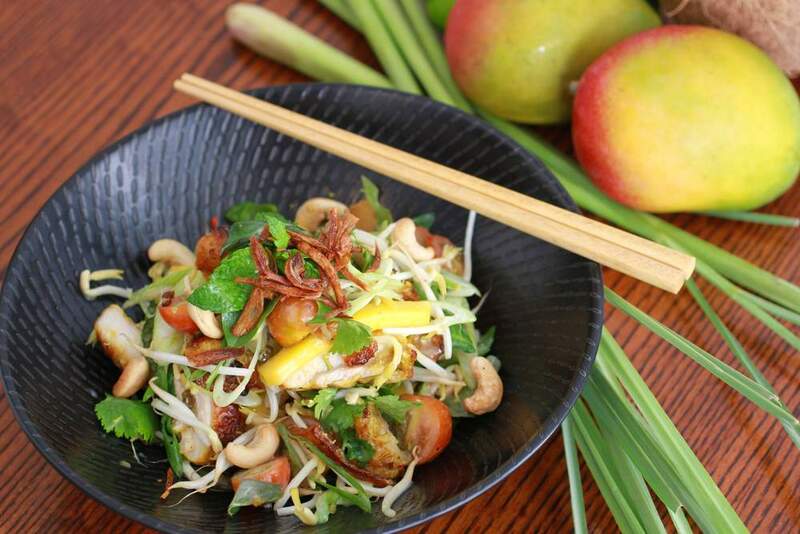 Originally from Northern Vietnam, Le - the owner and chef - has truly brought the authentic flavours of Vietnam to New Zealand. The minimalistic features of the interior space gives room for the diner to solely focus on the dishes in front of them - dishes full of flavour, colour and texture. Although the dining experience was a little more sophisticated then the street tables I ate at in Hanoi, Apache has now become my go-to for the most authentic North Vietnamese cuisine in Wellington.